Avengers: No Road Home #6 Review – AiPT! The Avengers…featuring Conan the Barbarian! If the cover hasn’t tipped you off, this issue will: an Avenger has made contact with Conan the Barbarian. In the last issue carried forward the story of the Avengers vs. Nyx, a Greek god who killed all of Hercules’s family. Things are looking bleak, but with Conan possibly on their side, how can they lose? This is a-Conan heavy issue taking place mostly in his homeland and following his adventure with Scarlet Witch. Conan and Avenger fans should dig this tale. The creative team commits to Conan’s homeland in this issue, essentially telling a side tale while we wait to see what has become of the Avengers. Scarlet Witch is blind and also trapped in Conan’s land, but has the aid of the barbarian. Writers Al Ewing, Jim Zub, and Mark Waid make this a fantasy tale that could only be told in a Conan comic thanks to dangerous cities, magic looming behind every shopkeep door, and the like. This issue succeeds largely because it steeps itself in Conan storytelling while also giving Scarlet Witch and Conan moments to bond and become allies. They may not fully trust each other, but the adventure they’re on is bringing them closer. There’s also a quick check in on Hulk, Rocket Raccoon, and Hawkeye, which is delightful. Immortal Hulk continues to be one of the freshest takes on an old school villain. He’s frightening, confident, and very much vengeful. A quick barb at Hawkeye, for instance, shows he does not forgive him for killing him. Sean Izaakse draws this issue with color by Jay David Romos with Marcio Menyz and letters by Cory Petit. Izaakse does well with the fantasy stuff, be it swordplay or giant monsters. There’s an epic double page layout you have to see, which spills into a great fight sequence. I also enjoyed the fact that Conan isn’t stuck with one expression, but many. He comes off as realistic due to moments of doubt, shock, and meaningful listening to Scarlet Witch, for instance. These two bond on the adventure. I said this with my review of #5, but the series isn’t moving forward as fast as some might like. It’s weekly though, so it’s hard to complain too much, but this issue is an example of how the narrative is in no rush to push too far ahead. It does have a good reason since Scarlet Witch and Conan are off on their own adventure, but ideally, this series would be read in the collected format. Marvel Comics has cleverly snuck a Conan comic into an Avenger comic with great results. This has everything you’d want in a Conan book and I’d even wager it’s a good place to start for Conan the Barbarian virgins. Make no mistake, Avengers: No Road Home is filled with surprises — this issue is proof of that. 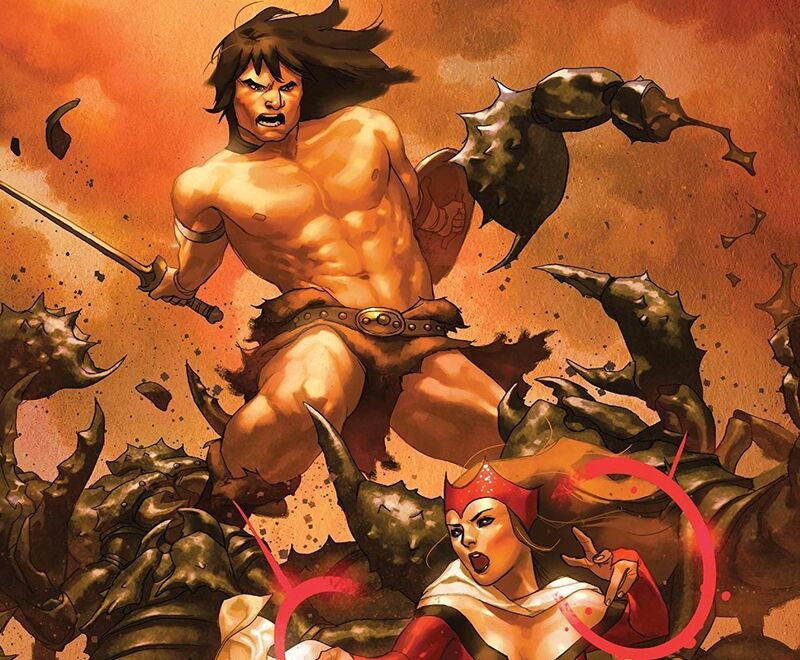 Marvel Comics has cleverly snuck a Conan comic into an Avenger comic with great results. This has everything you'd want in a Conan book and I'd even wager it's a good place to start for Conan the Barbarian virgins. Make no mistake, Avengers: No Road Home is filled with surprises — this issue is proof of that. Fabulous art, monsters, sword fighting...this has it all!